In and around February 2019, there will be a hot springs promotion campaign at 16 hot spring facilities in Kyoto City. or mention that you have read this web page when you make a reservation to receive a special gift and/or discount. Different facilities offer different gifts and/or services for this campaign. The campaign period also varies from facility to facility. Please check the details of the campaign and enjoy hot springs as often as you like! 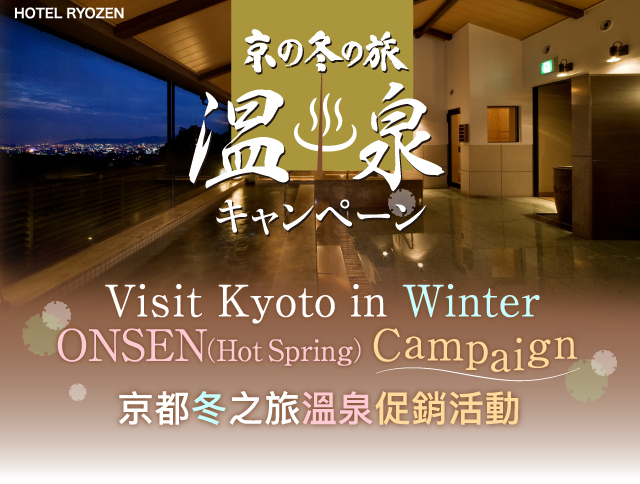 “Visit Kyoto in Winter” hot springs promotion campaign. *To receive special gifts, discounts, or services in this campaign, you need to show this web page. Bath salts made with hot spring water in Kyoto will be given. * Please ask us when you make your reservation. Suiran's original bath salts will be given. Adults (junior high school students or older): 600 yen (Usual fee: 830 yen on weekdays/1,000 yen on weekends and holidays) *Discount available for up to 4 people. *In the case of one-day visits, available offers are limited to set plans with a meal, etc. 2019 Fortune Calendar will be given. Please choose either the hot spring fee discount or the free rental bathing set. A little gift will be given. An original towel will be given. One drink (beer or non-alcohol beverages) will be given at dinner. Our original cosmetic facial oil blotting sheets will be given. White miso ice cream will be given.